Home Sweet Homeowner Tax Breaks! A Homeowner’s Guide To Taxes! Congratulations, you’ve just taken another step up the American-dream ladder and are a homeowner. Along with the joy of painting, plumbing and yard work, you now have some new tax considerations. The good news is you can deduct many home-related expenses. These tax breaks are available for any abode—mobile home, single-family residence, town house, condominium or cooperative apartment. The bad news is, to take full tax advantage of your home, your taxes will likely get more complicated. In most cases, homeowners itemize. That means you’re not living on “EZ” Street anymore; you’ve moved to Form 1040 and Schedule A, where you’ll have to detail your tax deductible expenses. For many homeowners, the effort of itemizing is well worth it at tax time. Some, however, might find claiming the standard deduction remains their best move. If you do find that itemizing is best for your tax situation, here’s a look at homeowner expenses you can deduct on Schedule A, ones you can’t and some tips to get the most tax advantages out of your new property-owning status. Read more here, and also by clicking on the image above. Selling Your Home? Here’s Your How-To Guide! Butterflies–Attract them to Your Garden! Butterflies—Attract them to Your Garden! Butterflies are the ultimate sun worshipers. Plant your butterfly garden in an area that gets a solid 6 hours or more of sunshine every day. Pay attention to the seasonal changes, too. The best site for a butterfly garden will get lots of sun from early spring to late fall, not just in the summer months. Is Your Basement Getting You Down? In some home designs, basements and cellars are nothing more than storage or utility spaces in a house used to hold fuse boxes, air-conditioning and water-heater systems, breaker panels and the furnace. Today, savvy homeowners have completely waterproofed their basements and expanded the use of their below-ground space, converting it into a thoughtful extension of their aboveground living space. The design minded have also turned their basements into entertainment lounges with a full wet bar, a guest room, a man cave, a home gym and a home office. If your basement space has little to be desired, check out these gorgeous options. This cover picture defines a contemporary style with ‘rational’ cabinetry–Atmos Collection in Bookmatched stripey oak and a bog wood horizontal wood grain finish. 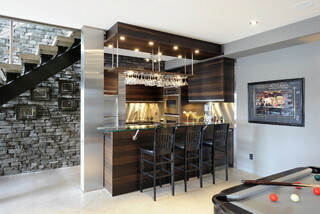 The bar features a stainless steel back splash, antiqued cambrian black stone surface along with a glass bartop on stainless step posts, with footrest. A floating (ceiling hung) decorative bulkhead with lighting and wine glass racks finishes it off. WOW! Just beautiful! Click on the image above to view more great options for your basement face lift! Help Sellers Get More Bang for their Kitchen Remodel Buck! Kitchen Remodeling Can Help You Sell! If you are planning to sell your home in the near future, an attractive kitchen could really help to improve your chances of finding a buyer and getting a good price. Of all the home improvement projects you could carry out, a kitchen remodel is one of the few that could still give you a good return on your investment, despite the weak housing market. The kitchen is the hub of most homes–nourishing the body, mind and soul. A great kitchen can help buyers overlook other flaws in a home; one that’s not-so-great can quickly derail any hopes of an offer. • Replace all light bulbs with “true light” bulbs. • Clean all windows, windowsills and screens. • De-clutter cabinets and drawers. Pare down the number of plates, glasses, dishware, utensils and cookware stored in your kitchen. • Clean out food storage areas (refrigerator-freezer-cupboards) to reduce the amount of food stored in your home. • If you have draperies or blinds in your kitchen, have them professionally cleaned. • Make sure your stove, refrigerator, cupboards and drawers are immaculate. How to Increase a Home’s Usability! With buyers looking for homes that will be usable for years as their family needs evolve, design pros are stepping up to meet the challenge with a variety of flexible solutions. Click on the picture to read more.